The carved church’s walls have unfortunately been damaged by careless visitors for years. The depiction of Seljuk Sultan Mesud II with a turban and kaftan on Kırkdamaltı Church at Ihlara Valley in Aksaray province, known as the "gate to Cappadocia," is gaining attention. Sultan Mesud II is praised with the words "The holy of the holiest" on the church walls. 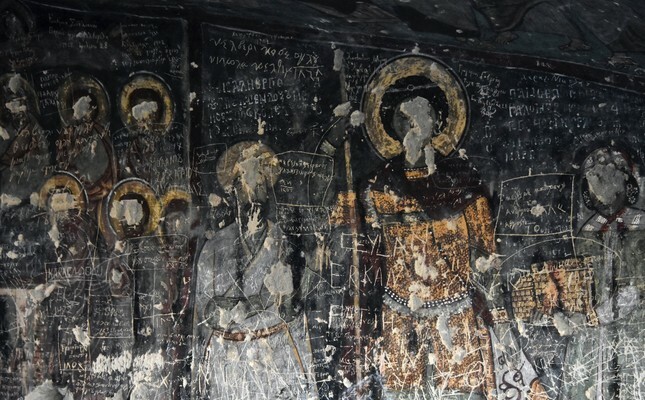 Sultan Mesud II is known to have embraced Christians who settled in the Cappadocia region after escaping the pressures of the Roman Empire and therefore, he was painted on the walls of the church. Ihlara valley, deemed as the start of Cappadocia, has traces of Christianity in Anatolia. There are more than 100 carved churches on the banks of the valley located in the village of Belisırma. The most important of these churches is the Kırkdamaltı Church, known as Saint Georgios. According to the inscriptions inside, the church was built between 1283 and 1295. Christians who migrated to the Cappadocia region under the Seljuk state, escaping from the pressures of the Roman Empire resided here. According to the inscriptions at Kırkdamaltı Church built by Christians, they have been praising Seljuk Sultan Mesud II. It is believed that the person depicted with a turban and kaftan is Sultan Mesud II, who was known for being respectful to Christian beliefs, along with Amirarzes Basileios and his wife Tamara, who were ruling the region. Aksaray Municipality Culture Center's Manager Mustafa Fırat Gül noted that Ihlara Valley was home to various civilizations and added, "Ihlara Valley is not only a piece of heaven in the middle of a steppe. It has been a home to various beliefs. We can notice that many civilizations and nations lived here together. The Kırkdamaltı Church has different characteristics." "We witness that the ruling state respects and shows tolerance to another religion. Seljuk Sultan Mesud II, who was ruling at the end of the 13th century has shown respect to especially Orthodox Christians, who escaped from the oppression of Rome as Catholics of the period did not allow Orthodox beliefs and raided Haiga Sophia through Crusades," he added. "Yet, Seljuk Turks tolerated different beliefs and allowed them to worship. Therefore, non-Muslims reciprocated to this gesture and showed respect to Sultan Kılıçarslan and the ruler he assigned and they have depicted them on their churches. We would like everyone to see this scene, which has welcomed visitors for 700 years," he said. Gül explained that the carved church's walls have been seriously damaged by humans. "They have written things on the pictures, scraped the faces of people depicted. We need to own up to our historical artifacts. This is the main culture of Anatolia but this is also a part of ourselves," he said.